I was up extra early on Monday morning, there was lots to get done before I could go and pick up our special visitor. It didn’t help at all that the temperature had once again dropped. My taps were frozen solid, the hose pipes lay like uncooked pieces of spaghetti and to cap it all, it was like walking through pea soup in the dense fog. After making sure all of our inmates were fed, watered and happy, the dogs walked and the Bosky stove in our kitchen was lit and all fired up, I was all set to leave. I grabbed what I needed but as I made my way to the Land Rover to head out I noticed that I had forgotten to do something. All of the footpaths were very icy and so I started the Landy’s engine to warm her up and whilst it was getting all cosy for me, I set about gritting all the areas which were remotely slippy. Before long I was on my way but I soon realised that due to the fog it was going to take a while to get safely to my destination, south of Sheffield. There were a number of accidents which held me up en route but eventually I arrived at Pete’s place. Pete was the owner of my cattle, before myself, but on this occasion it wasn’t a cow I was coming for. The time had come for me to pick up Max. After a chat we walked around to a pen inside his barn and although there were a few animals in there, my eyes immediately caught sight of the main man as he ran up to the side of the pen to greet us. The gate was opened and Pete leaned over and picked up the cutest little pygmy billy goat you could ever imagine. 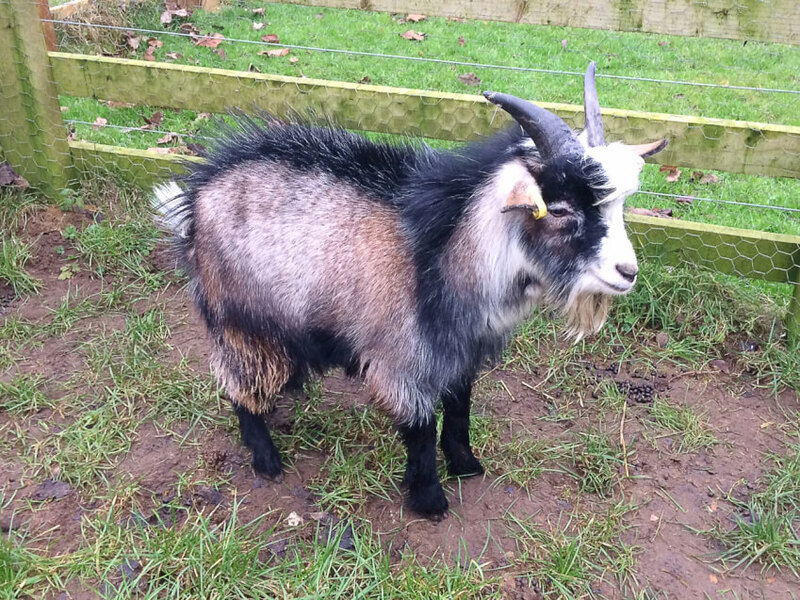 You could just tell he was excited to come and party with Stacey and Bambi, our two pygmy goats. Straight away I thought, the women folk are going to be cooing over this one and guess what, that’s exactly what happened. As soon as I got back and was walking him around to his holiday home, they were out fussing over him. Our two goats just watched from afar, in fact Stacey ran up their steps to get a better view. Initially they looked confused and a little surprised as they watched me walk ever closer to their pen. Who was this mysterious short, dark and handsome stranger who was coming their way? Why was farmer Shaun bringing him here? The answers to those questions will I’m sure be answered in the coming days. I soon left them to become acquainted and went off to get on with my chores. I’m sure I’ll update you in the coming weeks. I find that there are so many times in our year which are exciting and even now with the cold dark nights and even colder dark mornings, there are things we are looking forward to. It’s such a blessing whilst going about my work each day to notice our ewes already flourishing. I know that there is still another nine weeks to go before they start lambing, with Mabel and Pip, both first time mothers, leading the pack, but they do all appear to be really thriving, which is such great news and a joy to see. Spring is a particularly exciting time, with the whole place greening up at last, with Betty and Mildred having ducklings, countless nests being constructed around us and the flower beds will be awash with bright colours after they have awakened from their long winter kip, and I really cannot wait for all that is to come.